At David Cronenberg: Evolution, 2014. 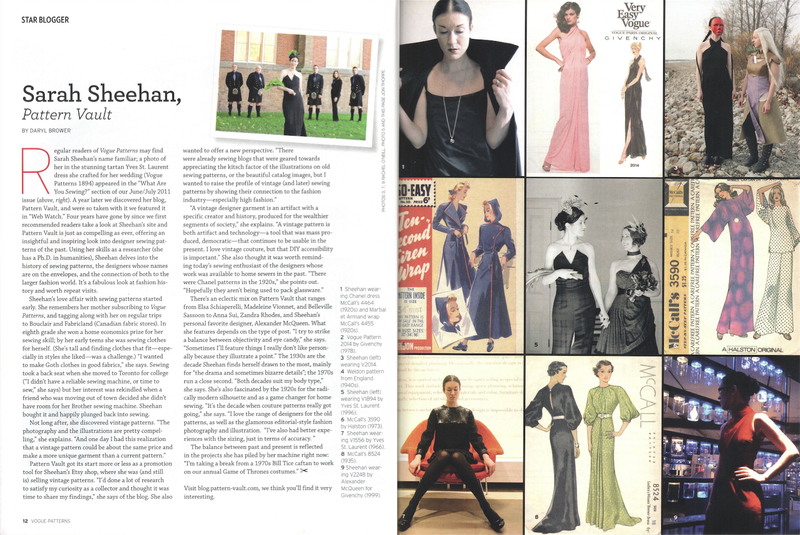 Sarah Sheehan is a writer, fashion historian, and sewing industry observer. Following a PhD and postdoc at the University of Toronto, she launched the PatternVault blog in July 2011 with a series on Givenchy sewing patterns by Alexander McQueen. The blog aims to document and celebrate the rich history of home sewing, with a focus on the intersections between high fashion and the commercial pattern industry. (Other interests include costuming, needlework, and Game of Thrones.) Originally from Ottawa, she lives in downtown Hamilton. For more, see the recent interview in Vogue Patterns / Sew Today magazine. Love your blog too. Am adding it to my blogroll. I hope it’s o.k. if I add you to my blogroll. Such amazing stuff! Hi Sarah, sorry I didn’t let you know about the finished suit. It turned out well don’t you think? Although it was a heck of a journey getting there. Thanks for the pattern and it’s very encouraging that you take an interest in what happens to your patterns after they leave you. I’ll be trolling for some new ones soon. I just learned of your blog through the June/July 2012 Vogue Patterns magazine. I’m glad they featured you because I really like what you are doing here! I love learning about fashion history too and do it through featuring museum exhibits in NYC on my blog. It’s nice to meet you and I look forward to making your site a regular read. Thanks so much, Jill. I wish I could get down to New York more often—the fashion exhibits are just incredible! Hello 🙂 I inherited my mother’s sewing room. She had hundreds[?] of patterns from the 50-90s. Would you be interested in purchasing any/all of them? Please contact me at the info provided. I live in Pickering. Thanks! Will do, Marlaine. I’m envious of your letterpresses! Hi – I just wanted to leave a reply again. I’m still working on getting these organized – I will get pictures assembled. I have rec’d phone calls as well from people interested in certain patterns. I don’t think I’ll be going through each of the patterns for specific ones – thank you, though, for your interest. Hi Jane, Glad you’re enjoying it! Yes, Jean Muir did a lot of patterns, initially with Butterick in the mid-60s and switching to Vogue in the ’70s-early ’80s. I’d been planning to discuss her earlier, Jane & Jane designs in my Mad Men series, so thanks for the reminder! Thank you for visiting my site and for liking the post “Handmade and Fabulous: Alexander McQueen Kimono Jacket”. May I add your site to my blogroll? Of course! Thanks so much, Blithe. I plan to link to your tutorial soon. Really love your Pattern Vault (and your bio/reasons why)–I too come from an “inherited” love of sewing fabulously-in my instance from both mother and grandmother. I was in search of a particular YSL suit pattern from the early l960’s and was hoping to find on your site. It was a suit my mother made for me which is now long gone (how I wish I’d stored her extraordinary, decades of patterns, as well as the clothing she made for me, particularly the YSL’s ones.). For more than 50 years I have followed fashion and continue to be fascinated by it’s many facets as well as it’s history. Thank you for re-inspiring me. In terms of YSL patterns, if you didn’t see your suit in my Mondrian post or the Vintage Patterns Wiki, for the early ’60s it could be a Dior.. Hard to find these days, but lovely! I love your mix of history, fashion, and sewing. Seems our blogs have more in common than just the theme we chose. I also blog about fashion and history. My grandfather was a shoe designer and manufacturer. Now that I’ve discovered your blog I look forward to following it. Hi there! Just wanted to let you know that I’ve nominated you for a Very Inspiring Blogger Award: https://livingincolorblog.wordpress.com/2015/06/12/very-inspiring-blogger-award/. Because I always feel inspired to sew something amazing after reading your posts. Thank you for all your hard work and research. I really enjoy reading your blog. Seeing all the background to designs is enlightening. Have you written about Edith Head? I’m loving your blog! I’ve become so disillusioned with clothing that is available now a days. it’s all very much of a muchness and no colour or freshness to them and I’m looking into making some myself now. I was wondering if you have any or know of anything patterns etc like the dresses worn by Alicia Vikander’s character Gaby in the movie The Man From Uncle (2015). I’m obsessed especially with the green and cream outfit and the orange culotte mini dress/playsuit too. Just discovered your fascinating site – my Mom was an avid and highly skilled sewer in her younger days and made nearly all my clothes for many years and continued sewing well into her 70s. Unfortunately I didn’t inherit any of her skills (I knit instead) but looking at the old patters brings back many happy memories. Thank you! Great new look to the blog. You must put a huge amount of time and effort into all of this, and I am sure we all appreciate you for doing this. Always good to see you in my inbox!